Love is in the air with hot air balloon rides. 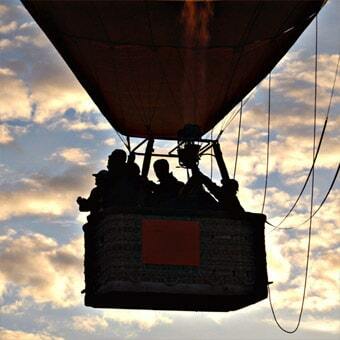 Hot air balloon rides can make an ideal gift for you and your special someone. It’s absolutely an amazing experience to celebrate the holidays with your loved one while creating unforgettable memories above the ground. Imagine yourself floating peacefully over the beautiful scenery below with nothing but the blast of the burners to interfere with the serenity of the open sky. If you’ve never taken a hot air balloon ride, it’s time you did. Hot air balloon rides have become very popular throughout various parts of the country because they deliver such a unique experience. If you’ve always wanted to enjoy the amazing view from the sky, you’ll be delighted to know that there’s nothing like experiencing the view from a hot air balloon. Instead of zooming quickly and noisily across the sky in a helicopter, or struggling to see from the windows of a cramped airplane, a hot air balloon ride enables you to peacefully take everything in as you and your loved one float gently through the clouds. SHOP NOW and choose the region of your choice! A breathtaking ride is an incredible gift for everyone. I have always wanted to take a Hot Air Balloon ride. It would be so remarkable. I would take my teenage son with me. Thanks for the chance. #Christmas #Christmasgifts #giveaway. I sure would like to win!!!!! !